I first encountered the concept of tikkun olam in a conference room at a hotel. I was in the middle of meeting the speaker after her talk to let her know that her story had made an impact on my heart. Her name was Jalia, and with her deep brown hands in my pale ones, she was saying, “Oh, you should come to Uganda!” She was telling me all about her workshop there in Kampala, which was filled with working women, some there to make extra cash to pay their children’s school fees, and some the primary breadwinners in their homes—if they didn’t work, there would be no rice, no clothing, no medicine. There were sad stories, stories of hope, and many in-between stories as she talked excitedly about these women, her friends. Oh, what a consistent and dignified job and a fair wage could do. Some had gone from sleeping on dirt floors to purchasing a mattress for their family to share. Some had bought homes who once had none. Some had recruited friends who were also struggling to make ends meet and watched their lives transform too. Now they had American companies placing large orders for their jewelry each season. Now they had community as they sat in wide circles, cutting colorful paper and threading delicate beads onto string. Now the whole town was transforming as the women began to have purchasing power, giving needed business in turn to the local merchants who sold supplies for their workshop and their homes. I listened intently to all of Jalia’s stories, breathless: all this because this one Ugandan woman started making paper beads into jewelry and teaching other women in her community how to do it too. There is an ancient Jewish idea known in Hebrew as tikkun olam, or “the fixing of the world.” The idea is that God allows us to participate in the healing of the world we broke in our sin, rather than simply snapping his fingers and fixing it all himself. He doesn’t need us, but he lets us put our hands in and help anyway. Thinking about this always renews my wonder at what a kind God we serve. It reminds me of a good father letting his children help fix the car or cook dinner: he knows it would probably be quicker and easier to do it himself, but he lets them help anyway so they can learn and grow. I think this is God’s attitude toward us when it comes to learning how to live out real justice and be part of healing what’s broken around us. What came out of it was massive, restorative change for her entire community, but it all started with one small act of restoration. Sometimes we think we can’t do much to fix injustice in the world unless we have Beyonce-level cashflow or senator-esque influence. But my Ugandan friend Jalia was just a woman, in her local community, looking for ways to help support her family. She started making the paper beads into jewelry on her own and selling them at the local marketplace. Then, seeing that others had a need for extra income as well, she decided to teach her friends. What came out of it was massive, restorative change for her entire community, but it all started with one small act of restoration, one paper-bead necklace, two hands teaching two other hands to roll and string, roll and string. Like my Ugandan friend, what if we all can do something small, right where we are, to help put things right? Maybe we are not in the position to start a fair-trade company, or a cooperative, or a nonprofit. But I’ll bet there is something. Jesus practiced tikkun olam daily. While living among us in a human body, he limited himself to his local surroundings, but he still healed, fed, encouraged, and preached. And he did it one person at a time. He didn’t rush around, worried that he couldn’t fix everything and everyone in his limited time on earth. Instead, he did what was in front of him, faithfully serving the needs he encountered on a daily basis. And his life impacted not only a few small communities in ancient Israel but also the entirety of humanity. Jesus’s every action, culminating in the cross and resurrection, reminds us that we serve a God who uses acts of restorative justice—both large and small, set into motion by kings and everyday people—to heal this broken-down mess of a world. Yes, Jesus is God in human form, but he modeled for us the way we should also live: with humility, mercy, and kindness, knowing that those three little practices can change the whole world. I’m not anybody important or particularly wealthy, but after meeting Jalia from Kampala, I found a passion for fair trade and ethically made products, and started specifically seeking them out whenever I could. I couldn’t afford to switch out my entire wardrobe all at once for fair-trade items, but I could do an internet search on some of my favorite clothing and accessories companies and see what I could learn about their supply chains. I chose to stop buying from a few retailers I learned were utilizing well-known, unsafe sweatshops for production, and I also learned about some great companies and organizations in the process that I hadn’t heard of before, such as Able, Krochet Kids, Noonday Collection, and 31 Bits. Like my Ugandan friend’s organization, these companies focused on providing dignified employment in vulnerable communities. 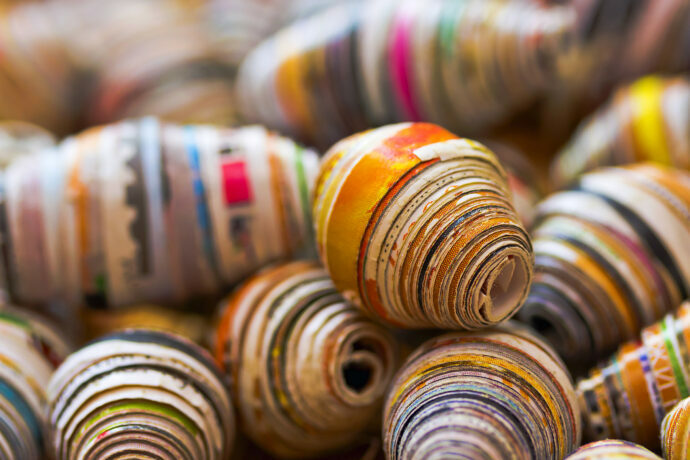 That’s when I learned that hope and justice can sometimes come in the form of paper beads, knitted hats, and hand-stamped jewelry. What injustice in the world lights a fire in your heart? Is it that some folks don’t make enough money to survive on and meet their basic needs? Maybe it’s time to look into changing your consumption habits to include a few fair-trade and ethically made items. Is it human trafficking? Maybe there is a local volunteer opportunity at a safehouse just waiting for you and your skills. Is it food insecurity, whether abroad or in your local community? Maybe there are some canned food items in your cupboards collecting dust that could feed a family, or maybe you could make a small donation to your local food pantry or another organization that helps feed those in need. It’s not about fixing everything that’s broken; it’s about doing what we can, where we can, to help put together the pieces one at a time. Could you grab that homeless person an extra sandwich on the way back from lunch rather than judging him for his predicament? (There’s a piece.) Could you shut down the unfair gossip about someone at church rather than allowing it to go on unchecked? (There’s another piece.) Could you donate to help rebuild a hospital in Syria that has been destroyed in the recent conflict? (Another piece.) Could you find a little extra kindness for the person at work who is honestly kind of a jerk? (One more piece of the puzzle.) This is how we tackle the brokenness in the world: piece by broken piece. One little bitty act of healing at a time. Tikkun olam. These little acts of justice don’t save us, and they don’t save others; only the blood of Jesus can do that. But what they do is let others know that God sees them in their pain and struggle and heartache. God rescues. God recognizes injustice and rights it. Justice is not only about punishment and retribution but also about restoration and hope. You and I can be instruments of this restorative justice, and we can do it right where we live, with what we have. We participate—or not—through the items we buy and whom we buy them from, the way we treat people, with our money, our words, and our volunteer hours, and whether we take care of the planet we live on. Every choice is a chance to restore or tear down. Every encounter with another person is an opportunity to speak justice or injustice into a broken world. May we choose well and wisely, and may we reflect Jesus in our every move as best we can. Cattie Price is a social worker from Kansas City, MO. She writes about life, Jesus, and finding goodness in the ordinary over at everydaygrace.net.